This article first appeared in the Dec. 26, 2011 editions of the Military Times newspapers. Click here to see the original version. It was a miserably cold fall Friday night in central Texas when Staff Sgt. Robert Griffin Jr. looked down into the eyes of his 11-year-old son and knew something special was going on. The S.C. Lee Junior High School Cougars of Copperas Cove had just defeated their local rivals by a single, hard-fought touchdown. 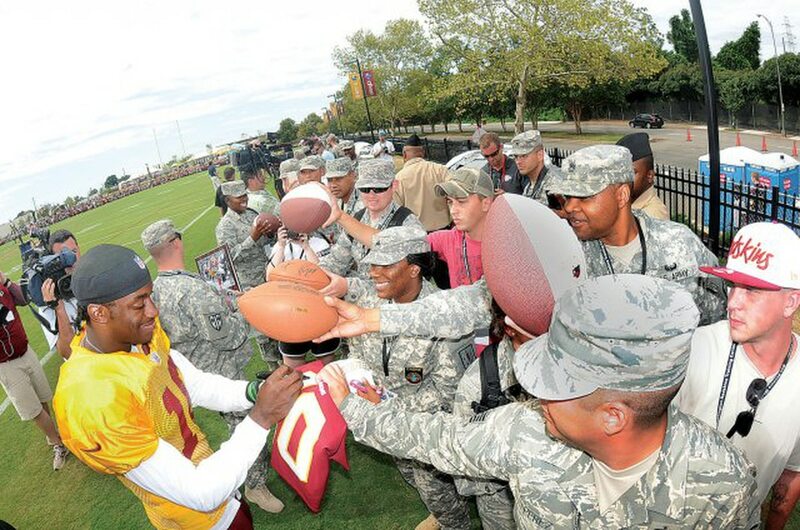 A tired, field-spattered Robert Griffin III was leaving the small-town gridiron, walking tall with a determined smile. "Report cards had just come out, and they'd lost half the team. It was cold, it was wet, it was muddy," says Griffin, recalling the details as if it was his son's most recent game. "Some of our players were still clean somehow, but Robert had mud on his chin, mud on his helmet and mud caked onto his face mask. He'd left it all on the field. That's when I knew he was serious about what he was doing." Ten years later, no one would argue with that. Just seconds after Baylor University's star quarterback was named college football's top athlete of the year Dec. 10, Griffin watched his boy walk up to him with that same determined smile. But this time, the now-retired soldier was the one looking up into his son's eyes as his 6-foot, 2-inch boy leaned into him and whispered into his ear, "Hard work pays off." It was the most intimate of moments between father and son in the most public of places. But entirely fitting. No one else could have known better exactly how hard the work had been. "This is unbelievably believable," the younger Griffin — popularly nicknamed RG3 — said moments later from the podium as he accepted the 25-pound bronze Heisman Trophy. "It's unbelievable because in the moment, we're all amazed when great things happen. But it's believable because great things don't happen without hard work." Head east out of Copperas Cove and within minutes you're driving through the middle of Fort Hood, home of III Corps and one of the Army's largest military installations where both of Griffin's parents retired from active duty. Baylor is only about 70 miles up the road. Long under the championship shadow of the Texas Longhorns two hours to the south, the entrance to Baylor's athletic building displays an award won by a punter in 2006. And that's about it. 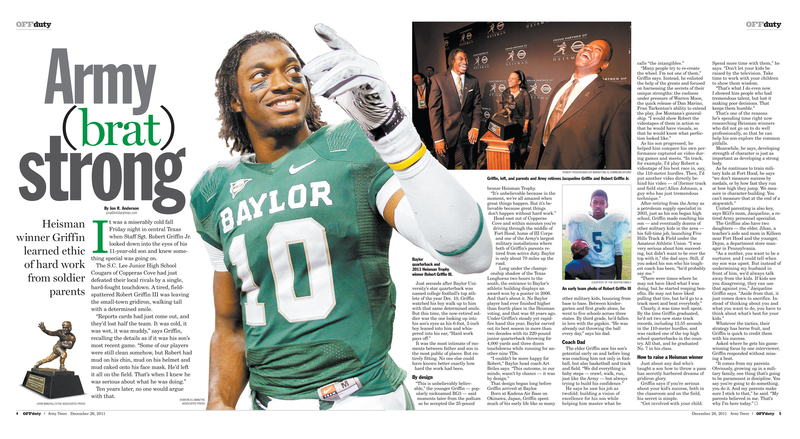 No Baylor player had ever finished higher than fourth place in the Heisman voting, and that was 48 years ago. Under Griffin's steady yet rapid-fire hand this year, Baylor carved out its best season in more than two decades with its 220-pound junior quarterback throwing for 4,000 yards and three dozen touchdowns while running for another nine TDs. "I couldn't be more happy for Robert," Baylor head coach Art Briles says. "This outcome, in our minds, wasn't by chance — it was by design." 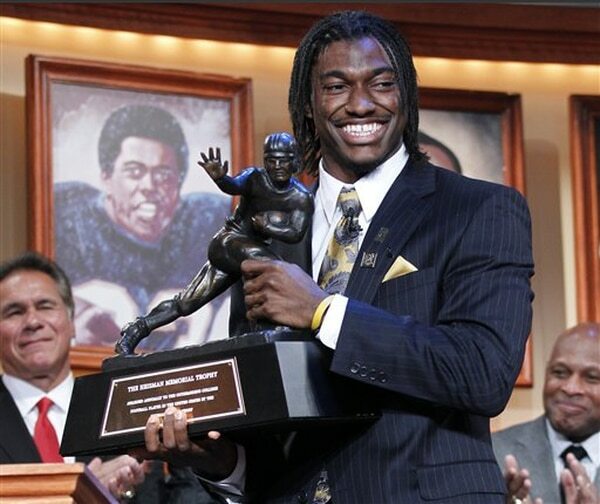 Robert Griffin III holds the Heisman Trophy after being named the winner Dec. 10, 2011, in New York. Griffin attended Baylor University, about 70 miles from his teenage home near Fort Hood, Texas. "He was already out throwing the ball every day," says his dad. The elder Griffin saw his son's potential early on and before long was coaching him not only in football, but also basketball and track and field. "We did everything in baby steps — crawl, walk, run, just like the Army — but always trying to build his confidence." He says he saw his job as twofold: building a vision of excellence for his son while helping him master what he calls "the intangibles." "Many people try to re-create the wheel. I'm not one of them," Griffin says. Instead, he enlisted the help of the greats and focused on harnessing the secrets of their unique strengths: the coolness under pressure of Warren Moon, the quick release of Dan Marino, Fran Tarkenton's ability to extend the play, Joe Montana's generalship. "I would show Robert the videotapes of them in action so that he would have visuals, so that he would know what perfection looked like." As his son progressed, he helped him compare his own performance captured on video during games and meets. "In track, for example, I'd play Robert a videotape of his best race in, say, the 110-meter hurdles. Then, I'd put another video directly behind his video — of [former track and field star] Allen Johnson, a guy who has just tremendous technique." After retiring from the Army as a petroleum supply specialist in 2003, just as his son began high school, Griffin made coaching his son — and eventually dozens of other military kids in the area — his full-time job, launching Five Hills Track & Field under the Amateur Athletic Union. "I was very serious about him succeeding, but didn't want to be over the top with it," the dad says. Still, if you asked his son who his toughest coach has been, "he'd probably say me." "There were times where he may not have liked what I was doing, but he started reaping benefits. He may not have liked pulling that tire, but he'd go to a track meet and beat everybody." Clearly, it was time well spent. By the time Griffin graduated, he'd set two new state track records, including 13.55 seconds in the 110-meter hurdles, and was ranked one of the top high school quarterbacks in the country. All that, and he graduated No. 7 in his class. Just about any dad who's taught a son how to throw a pass has secretly harbored dreams of gridiron glory. Griffin says if you're serious about your kid's success, both in the classroom and on the field, his secret is simple. "Get involved with your child. Spend more time with them," he says. "Don't let your kids be raised by the television. Take time to work with your children to show them wisdom. "That's what I do even now. I showed him people who had tremendous talent, but lost it making poor decisions. That keeps them humble." That's one of the reasons he's spending time right now researching Heisman winners who did not go on to do well professionally, so that he can help his son explore the common pitfalls. Meanwhile, he says, developing strength of character is just as important as developing a strong body. As he continues to train military kids at Fort Hood, he says "we don't measure success by medals, or by how fast they run or how high they jump. We measure in character-building. You can't measure that at the end of a stopwatch." 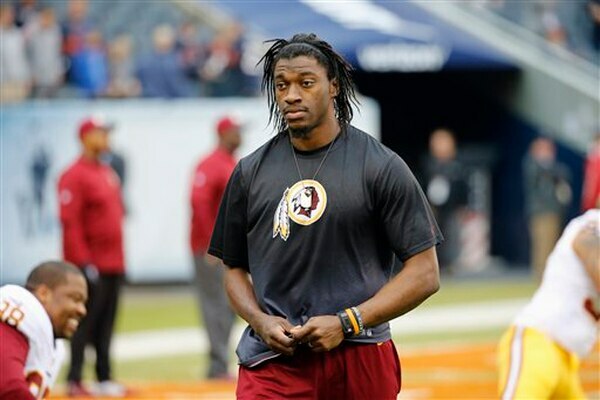 Then-Washington Redskins quarterback Robert Griffin III walks around as he greets his teammates on the field before a 2015 game against the Chicago Bears. He didn't take a snap for the Redskins in 2015, three years after being named the league's top offensive rookie. "As a mother, you want to be a nurturer, and I could tell when my son was upset. But instead of undermining my husband in front of him, we'd always talk away from the kids. If kids see you disagreeing, they can use that against you," Jacqueline Griffin says. "Aside from that, it just comes down to sacrifice. Instead of thinking about you and what you want to do, you have to think about what's best for your kids." Whatever the tactics, their strategy has borne fruit, and Griffin is quick to credit them with his success. Asked where he gets his game-winning focus by one interviewer, Griffin responded without missing a beat. "It comes from my parents. Obviously, growing up in a military family, one thing that's going to be paramount is discipline. You say you're going to do something, you do it. And my parents make sure I stick to that," he said. "My parents believed in me. That's why I'm here today."